Yes, Julia… I feel exactly the same. I really like to eat. Anyway… bonjour tout le monde!! So I’m just at the end of my third week in la belle France & yesterday my friend and I decided to go all out and cook a proper French meal. No skimping this time! And the meal of choice for two seafood addicts? Moules, obviously! I’ve been obsessed with mussels ever since I went to Nice for a long weekend and had the hugest pot of the most gorgeous mussels, but I’ve never tried cooking them myself… until now. And I had absolutely no idea it would be so easy! We were thinking of doing a cheese and bread and wine night to be honest, but one look in the window of the local traiteur and it was decided. Mussels for tea! As for a recipe, we didn’t really use one… We just asked the woman in the traiteur how exactly one should go about cooking mussels. 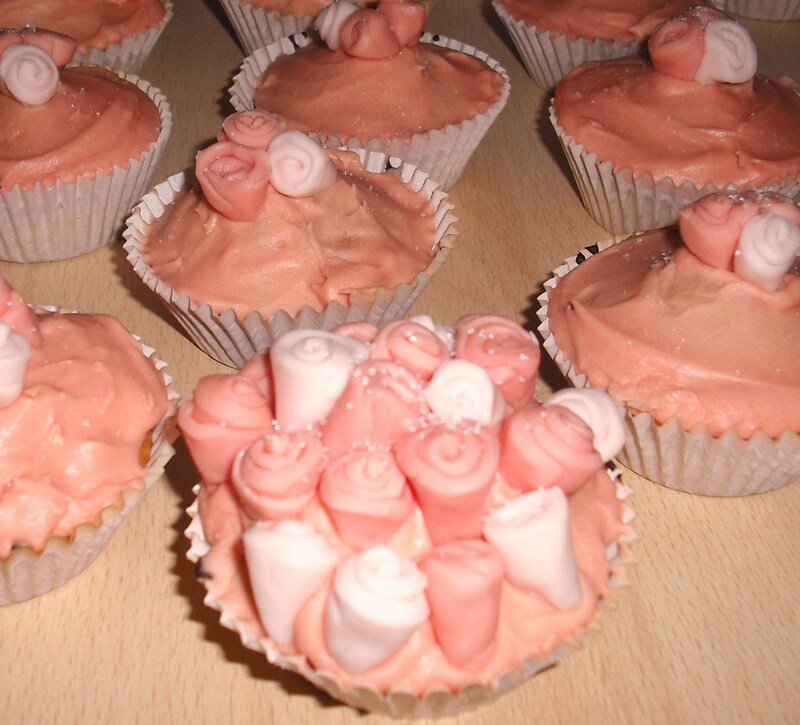 She said we could either eat them cold (which I have never heard of before!) or whack them in a pan for 10-15 mins and then add some crème fraîche and reduce for a bit. We chose the second option, decided to add a shallot as well and bought some French bread to mop up all the sauce with! Oh, and some lovely white wine to wash it all down with, of course! 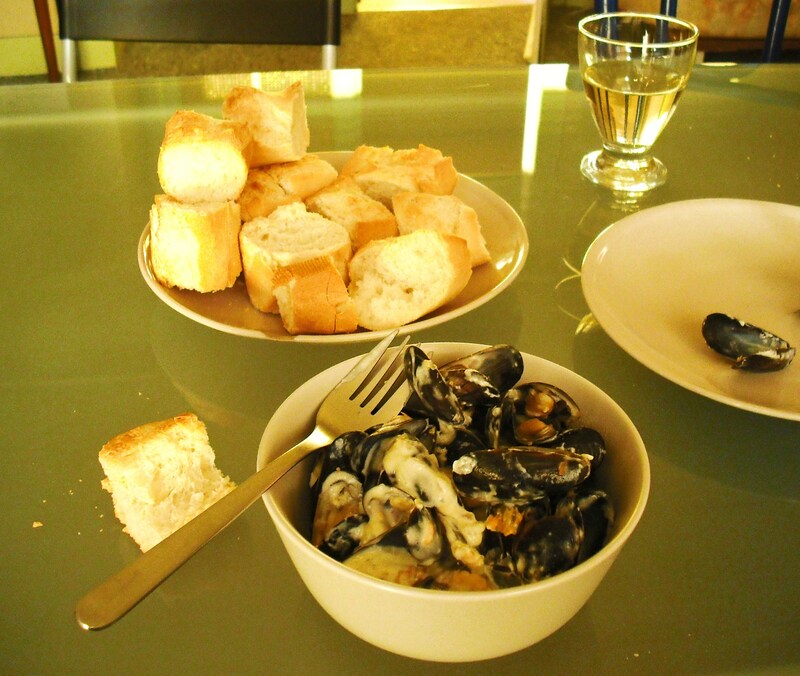 Now that I know that mussels can be so cheap and easy to make… well, I think they might be on the menu more often! But what could possibly follow such an amazing main course you ask? 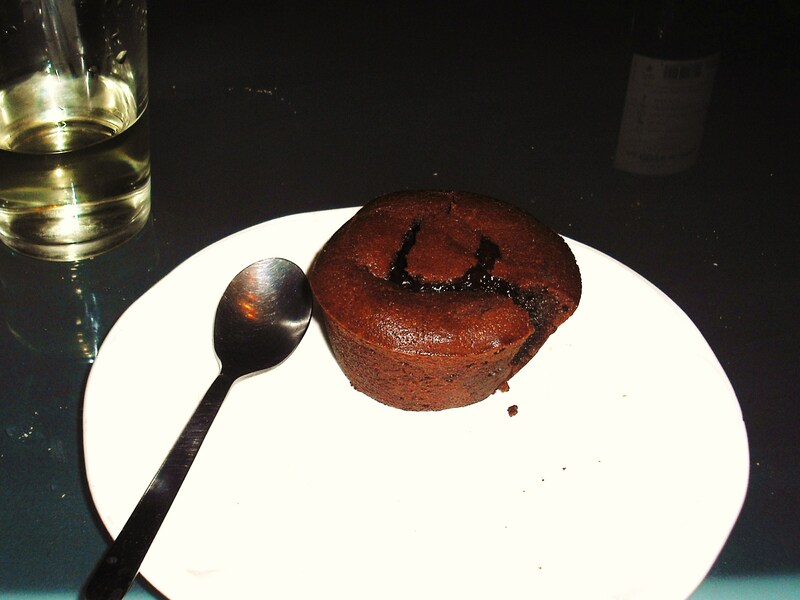 Coeur fondant au chocolat, naturellement! I’m not going to lie and pretend we made these ourselves. Without an oven that would be pretty difficult anyway. No, we picked a couple up when we went to get the bread (they were looking at us & begging to be taken home and eaten!). Then we simply put them in the microwave until they were warm and oozing chocolate, and voilà! Anyway, this meal was the perfect culinary end to my first working week in France and I’m looking forward to sampling more French cuisine while I’m out here! I love how their relationship was portrayed – my favorite clip in the film. France is a paradise for people who love to eat (like us and Julia!!). I’ve been in Paris and Vale du Loire in August and my god… I was lucky not to gain weight! Onion soup, cheese and baguette, macaron, chocolates…. every thing delicious!!! In portugal we do mussels just boiled and served with a olive oil, onion, red pepper and green pepper sauce, very good. Oh yes, French food is just so good! So indulgent too… Ooh that sounds really nice 🙂 I need to make it over to Portugal one of these days, my sister went this year and told me how lovely it is! Here the food is very good and the sweets… from heaven! eheheh You’re going to love it. Hey thanks for viewing my blog sacorthefood.wordpress.com and signing to follow. I look forward to your future post’s. Thanks for your time and consideration. Of course I will accept two thumbs up – thank you very much 🙂 I love that film, I quite often watch it when I’m baking, haha! Meryl Streep did a great job – her love of food (well, Julia’s really) is infectious! This entry was posted on September 30, 2012 by mixitupandmakeitnice in Coeur fondant au chocolat, Crème fraîche, Food, French bread, Mussels, Shallot, White wine and tagged Chocolate, French bread, French cooking, French food, Julie and Julia, Living in France, Moules, Mussels, Wine.